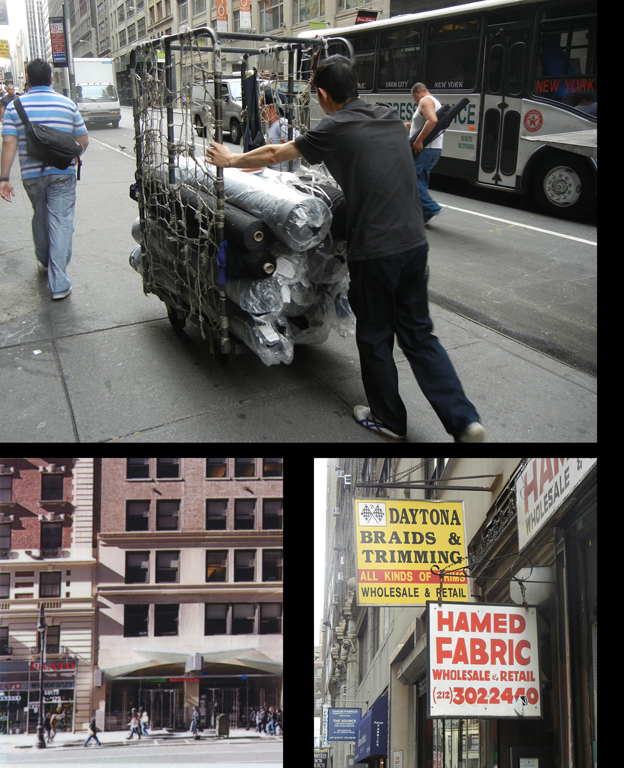 Photos of the Garment District, July 2012. Collection of Andrew S. Dolkart. Following the boom of the 1920s and the bust of the 1930s, wartime production of uniforms brought some prosperity to the garment industry. After the war however, manufacturing declined as more firms moved production out of New York, first to cheaper, non-union locations in the United States, then overseas, primarily to Asia and Latin America. Today, only a little manufacturing is still done in the district, although many fashion companies retain their offices, designers, and showrooms in New York, often in the same Seventh Avenue and Broadway buildings that housed earlier generations of jobbers. This changing emphasis on design and marketing is reflected in the new name for the business improvement district (BID), the Fashion Center. Many of the buildings that once housed garment factories and showrooms, including the Garment Center Capitol, have been upgraded for general office use, housing designers, lawyers, tech firms, and other businesses that now dominate the local economy. A special zoning district encompassing the Garment District was established by New York City in 1987, seeking to preserve manufacturing space. However, with rising rents and declining output, many spaces have been put to other uses. The future of the Garment District as a center for fashion design and manufacturing is in flux, Building owners have advocated for rezoning that would permit more conversion into offices, while fashion firms have insisted that mechanisms stay in place to preserve space for manufacturing.